21-year-old Dauntarius Williams started the incident when he said he found his car had been vandalized with racist slurs. Williams had parked his vehicle near the Kansas State University campus. The community immediately mobilized to discover ways of preventing such racist attacks in the future, including increasing community watch patrols and adding security cameras. According to the Daily Mail, KSU held an emergency meeting on the subject. 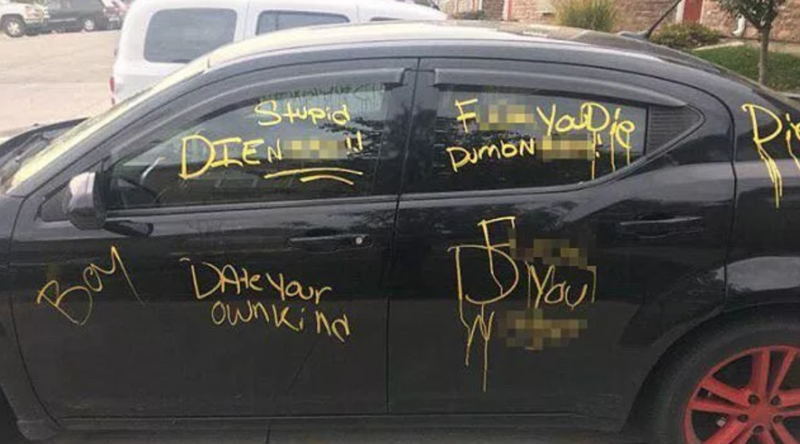 However, once the FBI announced that it would be sending its special hate crime division in to investigate the matter, it was quickly learned that Williams had vandalized the car himself. The young man stated that it was just a prank that got out of hand. Despite the false reporting of a hate crime, and the stoking of feelings of mistrust in his community, the local police opted to not press charges against Williams. With the election of Donald Trump, the national stories of racism and discrimination surged, with some of these instances involving individuals actually filing false police reports. The Drive By Media, anxious to find any evidence that the election of the Republican president has fostered an environment of hatred and bigotry, has prominently featured such stories in their daily newscasts and papers. While these false claims of racism are eventually discovered to be fake, the problem is that they cause irreparable damage to the fabric of American society, and strain the already tense race relations that exist in the nation. The additional danger is that the correction of these cases does not get the national coverage that the initial reporting receives. Meaning that there are those out there who still don’t know that this case was a hoax. Other race-based hoaxes have had more serious consequences. In 2012, for example, community watchman George Zimmerman discharged his firearm into black teenager Trayvon Martin. Zimmerman was on his back, screaming for help, and having his head slammed into the pavement. This was discovered to be true, based on the evidence provided during the trial. This is why false narratives about hate crimes and hate crime hoaxes need to be taken very serious. There are actual consequences when people believe that they are being targeted based on their race.